The 1 ounce Maple Leaf series of palladium bullion coins is - in many ways - special amongst others produced by the world's largest mints. Featuring .9995 fine palladium and an internationally recognized design, it is the only palladium bullion series in the world that brings together quality refining of a very special metal, high aesthetic value, extremely low mintages and investment credibility. Why buy 1 oz Palladium Maple Leaf coins? 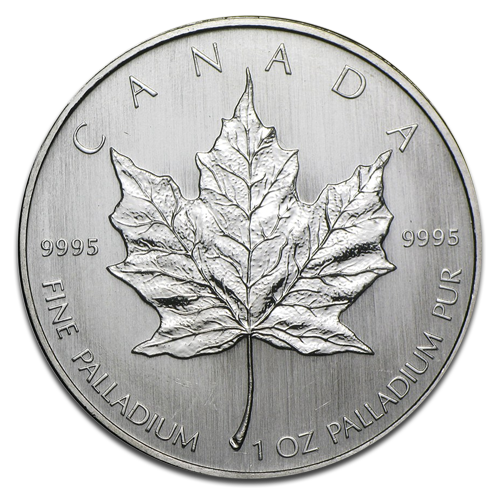 One of the very few palladium bullion coins in the market, the Canadian Palladium Maple Leaf has been the standard Canadian coin in palladium trading since 2005. This supreme quality product issued by the Royal Canadian Mint (RCM) in low circulation has been well accepted by investors and an instant success worldwide. Platinum Maple Leaf bullion coins bear strong trademarks of printing superiority and can rival the quality products of the world's leading mints. You can be certain that you are buying brilliant coins at brilliant prices. They are also the lowest mintage coins ever printed by the RCM so are in short supply meaning they will demand a higher sale fee. Canadian Palladium Maple Leaf coins provide investors with the means to diversify and leverage their investment portfolio, and are guaranteed to provide a unique, reliable investment in this rarest of metals. The Palladium Maple Leaf has a wonderfully attractive design, thanks to palladium, this rare and lustrous silvery-white metal that gives the motif a glowing soft relief. This makes it one of the most tradable coins worldwide, and gives investors a strong incentive to enter the stimulating world of the palladium market. These coins enable you to take advantage of the noteworthy price potential that the relatively young palladium market can offer. The 1oz Palladium Maple Leaf coin will be an invaluable asset in your investment portfolio. The one troy ounce Palladium Maple Leaf has a diameter of 33mm, and is 3.58 mm thick. The reverse side prominently features Canada's national symbol, a single maple leaf in an adorably soft relief and brilliant finish. Inscriptions include the word CANADA, and "9995 Fine Palladium, 1 oz." along the bottom of the coin. The obverse side features a head profile of Queen Elizabeth II by Susanna Blunt which has been a feature of all Canada's minted coins since 2003. The name of Canada's Constitutional monarch is inscribed on the obverse side, along with the fifty Canadian dollars nominal value, and the year of issue. The newest member of the Maple Leaf family of pure bullion coins, the palladium Maple Leaf, was first minted in November 2005.The Royal Canadian Mint produced the first government issued palladium bullion coin from 2005 to 2007, as well as in 2009. These coins were made of 99.95% pure palladium (.9995 quality),each coin containing one troy ounce of the rare precious metal. These specifics, guaranteed by the Canadian Government made the coin so commercially successful. The palladium Maple Leaf adopted the same esteemed Walter Ott design which was launched on the gold, platinum and silver series, the one showcasing the popular symbol of Canada. Although a counterfeit palladium coin is yet unheard of, the RCM employs meticulous quality control, and advanced safety measures to print the Palladium Maple Leaf. Each coin is manufactured to meet the high quality standards of the Royal Canadian Mint, and the weight, purity and face value of each coin are all guaranteed by the Canadian government. The coin's precise specifications and widely publicized design make forgery a very daring task and fake coins stand no chance of escaping the attention of experienced dealers. As leading distributors of palladium bullion coins, CoinInvest offer highly competitive rates on 1oz Palladium Maple Leafs, but with limited resources available you should order now whilst stocks last. To purchase your 1 oz Palladium Canadian Maple Leaf coins, sign into your CoinInvest account and click on the image above to take you through to the product description page. From there you can add the items to your shopping cart by clicking on the orange strip to the right of the image. We hope to process your order immediately, but please allow at least 10 working days for delivery, as some bank transfers can take a week before they reach us. If you have any Palladium Maple Leaf coins for sale CoinInvest GmbH would love to hear from you. We offer highly competitive prices based on current market value so do not hesitate to contact a member of our friendly staff who will prepare a fixed fee offer and confirm the same by e-mail.